L. Dama dama or Dama vulgaris, Eng. fallow deer. This is an exotic animal, very similar to common deer and its young are like the gazelle as their health is excellent. Roe deer is more delicate. 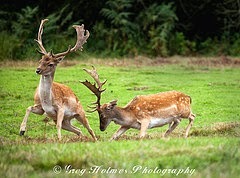 The fallow deer is in between male deer and roe deer in size. Its antlers look swollen like palms with several points. The snout is hairless and the tail is longer than the ears. It has a lion colored coat with white spots on the hypochondria or breastbone and belly regions, which join forming a stripe along the length of the body. The back is the plain color of a cuttlefish, which turns darker toward the tail. The tail is black on top and white on both sides and underneath. Each side is outlined with a black line. The head does not have white spots normally but the lips are white. On each side of the mouth is an undefined blotch. The white spots disappear in winter and the coat is a little darker. It lives in Mediterranean countries. In Spain, it is prevalent in the mountains of Toledo, the province of Caceres, in the Tajo River Valley and in the mountains of the province of Madrid but not in Cordoba according to Avenzoar. It exists in North Africa. The males and females are seen together only in summer when the mating season approaches, which is in October. Gestation takes 33 weeks. Normally, the female has one fawn, rarely two. Dama mesopotamica, another species in Persia, is more corpulent and its coloring is brighter than the species in Europe. It lives in the Laristan Mountains in Iran. This fact, of course, opened the doors for the fallow deer recipes that were taken to Al-Andalus from Persia. Villena explained that the meat should be carved in the same fashion as ox meat. Avenzoar said the meat was hot and dry and had a smoother substance then the common deer. 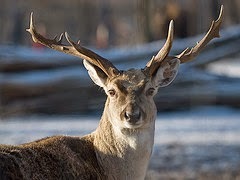 The European Fallow deer are not an endangered species. They are a protected game species throughout most of their range. They have been kept in game parks for hunting purposes almost from the time of the Romans. 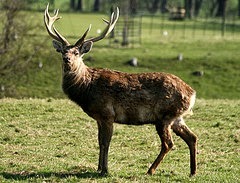 The Mesopotamian Fallow deer are considered endangered. See buey.